If you’re anxious to start your softball season off strong, then check out my Top 10 Tips! 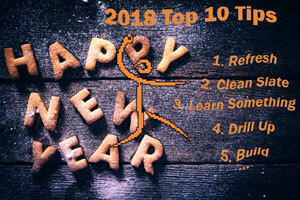 These quick tips will get you ready to make 2018 a success! Lots of things go into a successful softball season. You need talent and luck and everybody needs to stay healthy. But those things involve your players, but there are things that YOU can do to impact your season as well. Refresh Your Batteries – The softball season requires a lot out of you, so spend the remaining days of your holiday getting “refreshed” in whatever way you need to. You might need to eat better, sleep more, exercise or diet. Maybe you need to read a good book or watch some motivational movies – do whatever it is YOU need to be refreshed and at your energetic best for the upcoming season. Start Everyone with a Clean Slate – Last year’s season is just that – last year. So, leave all the drama and issues in the past. Give anyone returning a clean slate. That means you’ve got to forgive and forget and help them to do the same. Leave last year in the past, and start this year fresh and clean. Learn Something You Didn’t Know Last Season – The incredible thing about the internet is it’s almost impossible not to learn something new every day. Learn something you didn’t know last year. Maybe it’s a new teaching point for slapping or a different bunt defense or another way to reach closed off players, or, well, anything. Expect more out of yourself and learn something new for your new season. Drill Up to a Solution vs Just Down to a Problem – Finding fault and problems is easy. Problems are obvious, and fault is toxic. Ditch that level of thinking and discover solutions. If something from last year is still bothering you, then find a solution. If you can’t then wash it out of your mind but don’t bring last year’s problems into this season. Build for the Finish vs Start with a Bang – The start of every softball season is filled with energy, enthusiasm and hope. It usually means winter is over and it’s time to get outside. But as the season wears on, enthusiasm can wear out. Pace yourself. It’s ok to be happy that the season is starting, but keep some happy for the finish – no matter how your team is playing. The end of your season is as important as the beginning (I’d even argue more important) so build for the finish and save some of that happiness for the end. Do Simple Better – This is a great quote from Cubs manager Joe Madden. I love it because we tend to think the pros are so good because they do the fancy stuff better. When really, no matter what level of ball you play, if you’ll focus on doing the simple things better you’ll win a ton of ball games and it won’t have to come down to the fancy stuff. Spread it Around – While your team might be better if your pitching gets better, that’s a tough message to hear if you’re a pitcher. Instead of placing all those expectations on your pitching staff, spread the love around and have your hitting and fielding and pitching get a little bit better, and then collectively you’ll have something. People Matter – Always remember that you don’t coach softball, you coach people who play softball. This season, find more ways to reach more players. Learn some new words for saying old things. Discover how to better relate your older life to your newer players. Ask More and Tell Less – The one thing I’ve learned over the years is to ask players more questions and tell them less information. This takes a little longer and requires more patience, but it empowers your players, helps them discover the reasons behind the answers and doesn’t make them tired of hearing your voice. When your players aren’t on the softball field they’re in the classroom, so help them bring those brains to practice by asking more questions. Want to make your 2018 season a success – become a Vault Classic member. We’ve put hundreds of hours and thousands of dollars-worth of instructions at your fingertips. It’s your softball secret weapon!! Thanks Bob – Happy New Year to you too, and may 2018 bring you joy!